I've spent today filming an editing a video for you so be sure to come back to the blog tomorrow to check it out! Vinyasa flow is a yoga class which is suitable for everyone – from the beginner to the more advanced yogi. There is no competition and no expectations, allow yourself to drop into your own space and practice. 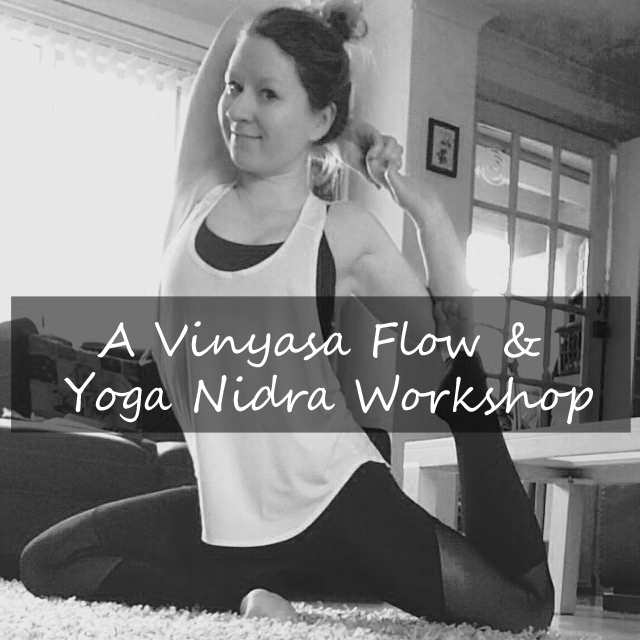 This workshop will start with a short meditation, then move into a physical practice – a 90 minute vinyasa flow. From there we will move into 30 minutes of yoga nidra. Yoga nidra is a guided deep meditation also known as a yogic-sleep. Yoga Nidra is a deeply relaxing, restorative and meditative class. It is a systematic method that induces mental, physical and emotional relaxation whilst lying down in savasana. During Yoga Nidra – Yoga meaning “union” and nidra meaning “sleep” – the practitioner appears to be asleep, but the consciousness is functioning at a deeper level of inner awareness. Yoga nidra takes you on a journey of concentration with breath awareness, body scanning, guided imagery and the setting of a sankalpa or resolution. You will feel a deep sense of calm and quiet, as if you are sleeping, but you will be completely awake and aware of yourself and your surroundings. It is said that one hour of yoga nidra is equal to four hours of restful sleep! The end result will leave you feeling incredibly peaceful, calm and aware. Sign up now! I would love to see you there! PS - There are only 3 spaces left for my Backbends 101 workshop on April 25. Before you go - There is a place for YOU on my yoga retreat to Thailand this October. Everyone is welcome. If you have any questions about payment or anything else please leave me a note but be sure to register your interest so you don't miss out! Early bird deals until April 30.